Published to substantial critical acclaim, Elizabeth I: Collected Works brought together for the first time in one volume the speeches, poems, prayers, and selected letters of Queen Elizabeth I (1533-1603), all in modernized spelling and punctuation. With this new volume, Janel Mueller and Leah S. Marcus give specialists fuller access to key originals of the queen's texts presented in Collected Works. The originals selected for inclusion here are compositions that survive in Elizabeth's own handwriting, in English and in foreign languages, as well as her foreign language compositions preserved by other hands or in printed editions. 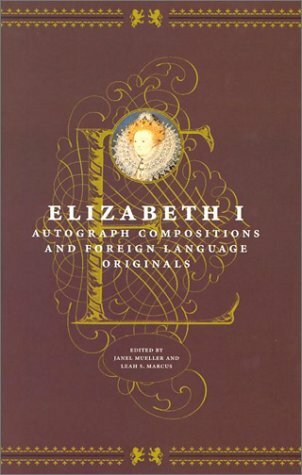 Presented in transcriptions that reproduce the spelling and punctuation of their sixteenth-century sources, these texts convey many of the expressive and significant features of Elizabeth's writing. Through the transcriptions of texts in her own hand, readers can track the queen's language and compositional style-her choices of vocabulary and phrasing; her habits of capitalization, spelling, and punctuation; her often heavy revisions and redraftings; and her insertions of postscripts and second thoughts. The texts in foreign languages, meanwhile, will allow readers to prepare their own English translations from these original sources. A unique resource for scholars of English literature and the Renaissance, this companion to the Collected Works offers much fuller and more detailed access to Elizabeth and her writings than can be obtained from the modern English versions alone.